A 3,000-year-old sculpture of a king’s head, unearthed in modern-day Israel, is at the center of a mystery that has baffled researchers the world over. 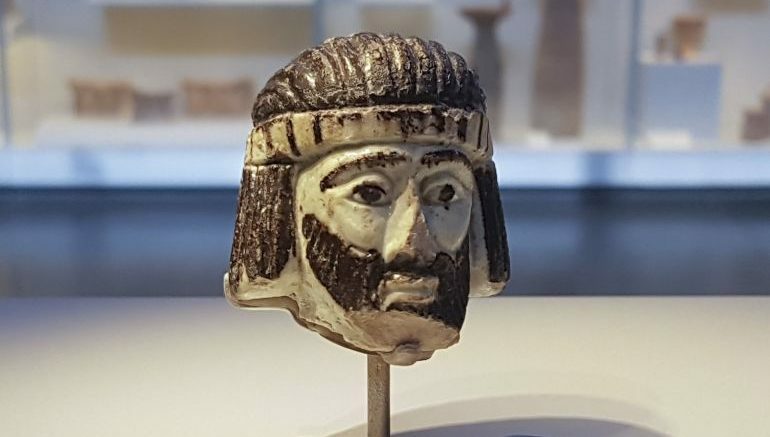 An extremely rare example of figurative art dating back to 9th century BC Holy Land, the 2-inch (around 5-centimeter) sculpture is remarkably well preserved, with only a tiny portion of the subject’s beard missing. Although experts are of the opinion that the stern-bearded figure with the golden crown represents royalty, they are yet to ascertain his identity and are even struggling to determine which kingdom he may have ruled. The sculpture, as per reports, was discovered last year at an archaeological site known as Abel Beth Maacah. Situated south of Israel’s border with Lebanon, around 1.2 miles (2 kilometers) from the present-day town of Metula and 4 miles (approx. 6.5 kilometers) west of Tel-Dan, the site comprises a mound with a small upper northern section and a large lower southern one, connected by means of a saddle. Originally uncovered by 19th-century archaeologists, the site was then home to a village called Abil al-Qamh, which interestingly is mentioned in the Old Testament’s Book of Kings. Back in 9th century BC – a period historically associated with biblical kings – the town was located in what was a liminal zone between three regional kingdoms: the Arameans, an ancient Northwest Semitic Aramaic-speaking tribal confederation based out of present-day Damascus, to the east; the Phoenician city of Tyre to the west and the Israelite kingdom, with its capital in Samaria, to the south. This location is very important because it suggests that the site may have shifted hands between these polities, more likely between Aram-Damascus and Israel. It was during the summer of 2017 that Yahalom-Mack and his team stumbled upon the 3,000-year-old sculpture of a biblical king while digging through the floor of a huge iron age structure. According to the researchers, the section where the figurine was found actually dates back to the Iron Age period of the ancient Levant, which is essentially associated with the rival kingdoms of Israel and Judah. In the Iron Age, if there’s any figurative art, and there largely isn’t, it’s of very low quality. And this is of exquisite quality. The color of the face is greenish because of this copper tint that we have in the silicate paste. The guy kind of represents the generic way Semitic people are described. Given that the head was found in a city that sat on the border of three different ancient kingdoms, we do not know whether it depicts the likes of King Ahab of Israel, King Hazael of Aram-Damascus, or King Ethbaal of Tyre, rulers known from the Bible and other sources. The head represents a royal enigma. Meanwhile, the team from Hebrew University and Azusa Pacific University is set to recommence excavations at the site where the sculpture of the biblical king wad found, later this month.